Ask fellow campers about "Square Dance Center and Campground" and nearby attractions. Rate is for water and electric only.. $3.00 more for sewer. This park is absolutely beautiful. Lots of pine trees and the river is on back side of campground. Feels like a country setting and so quiet. Maximum stay allowed is 14 days on average. Would definitely stay here again. While there we drove down to the Idaho visitor center about 45 minutes away, then stopped and did a hike on the way back. So much to see in the area. We camped at Square Dance Center and Campground in a Motorhome. Boondocking allowed for minimal amount. We really love Lolo and this is our second time at this park; prices have gone up a bit, but so it goes everywhere. Anyway, this is not a resort type of park, nor is it an urban park. It's in a lovely area, a bit off the beaten path and a bit on the funky side - all things we really like. Some people have said they don't like folks on the bicycles riding around - but I kindof found it charming. The old guys and gals always smiled and waved. Anyway, it's not for everyone, but one of our favorites. We had great Wi-fi most of the time - good enough to use the firestick, so that's always a plus. But occasionally, nothing worked, so it wasn't perfect. No cable TV either, but not a bad selection of antenna selections. It might be difficult getting a decent satellite signal as there are a lot of trees about. But even with these few quirks, we had another great time here and would come back again. We camped at Square Dance Center and Campground in a Motorhome. Took a nice drive up to Kalispell and Flathead Lake; ate at Montana Traders in Kalispell which was excellent. You're mostly on reservation land, and there are several museums worth seeing. One stop is the 1000 Buddhas about 25 miles north of Missoula. Worth seeing. Missoula has a cute downtown and there's the campus of UM, too. Also, head down 93 through the Bitterroot Valley at least to Hamilton. Plenty of cuteness abounds in the little towns and then you have the mountains right there. 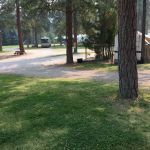 Sayed the first week of September wonderful park very wooded and private space cable tv worked good very quiet and relaxing close to lolo and close to Missoula would be great to stay longer. We camped at Square Dance Center and Campground in a Motorhome. Clean campground with lots of grass and trees. Easy back-in spot. Laundry includes 3 washing machines, cold water only, no dryers, but clotheslines and pins are provided, all free. Friendly campground, many square dancers, but you don't need to be a dancer to camp here. We camped at Square Dance Center and Campground in a Fifth Wheel. All sites are level with shade....our site was a pull in which I don't prefer but we were here for 2 days so it worked ok...we had elect and water only but a lot of sites are fhu....the staff was great and led us to our site....the services were fine, the restrooms and showers clean and a lot of hot water....good ATT cell signal and the WiFi was some of the best we have ever had at a campground.....cable tv had great selection of channels....the park is kept neat and clean...big rig friendly with a family atmosphere with disc golf, horseshoes....a lot of shopping, restaurants and gas stations close by and easy to get to with your rig...we would stay here again if passing thru.... We camped at Square Dance Center and Campground in a Motorhome. This is a square dance center/Campground and a fun place to stay. You're only 10 miles from Missoula, Mt. Random parking in the mature trees and simply a lovely location to stay. We camped at Square Dance Center and Campground in a Motorhome. In the evening you can go to the recreation hall and watch or participate in the round and square dancing. This our second year visiting Square Dance RV Park, and we've very happy both times. A well run, efficient operation. The owner is on site and has the system down. The park isn't the most modern but is clean and well maintained. The roads are tight but that left lots of tall pines through out the park. A very nice campground. We camped at Square Dance Center and Campground in a Fifth Wheel. Don't understand the high ratings this place has received. Chalk it up to evaluator differences, I guess. Lots of rules that are, IMO, over-the-top; don't let your dog poop or pee at your SITE, water the grass at your site if you're staying more than 4 days, do NOT leave your grey valves open because it allows sewer gas to escape thru your vents (never seen that rule in 6 years of RVing cross country), don't park on the grass, not even a little bit, even if your site is too short for you to park in line with your coach. Lots of tall trees that interfere with satellite. Some spots will get an open sky, but not many, and don't put your dish on an unoccupied site with an open sky view, even if there are a LOT of unoccupied sites. Cable was adequate, but not great. No fenced dog run, and don't let your dog off leash anywhere, even in a remote area of the park and you have bags to pick up after them. Seems like they water the grass here every other day, even in the rain. If you take your dog to one of the park's pet relief spots, you may end up dodging sprinklers. At least the park is mostly quiet, except when someone in a loud truck putters to/from their site. Will not stay here again. We camped at Square Dance Center and Campground in a Fifth Wheel. Tall pines provide ample shade, as well as, that nice pine scent. Nice walking path around the perimeter of park. Staff is frequently maintaining, keeping it clean, picked up and watering grass. Peaceful, easy feeling in this park. We extended our stay from three days to one week. Besides the park itself a highlight for me has been the Blue Mountain Trailhead. Highly recommend for walking or hiking at the very least take a ride there in Missoula. Very pretty area. Your dog will enjoy it also. Staff is very friendly. Some distant road noise from highway. Some dust kicked up when cars drive by. We camped at Square Dance Center and Campground in a Motorhome. Blue Mountain Trailhead, Missoula. Reserve Avenue in Missoula is a main shopping area. Park is a few miles out of Lolo nestled in a ponderosa pine grove. I was given a gravel pull-thru site for my 42'5th wheel (54) that had plenty of room for my rig. My site had water, electric, cable, and good wi-fi, no sewer. Some site have sewer some don't. There is a pump out station in the park and a service will come and pump you out for $10.They like to square dance here, but I'm no dancer. Park is quiet and well maintained. The laundry is free, but you have to hang your cloths to dry. I didn't hear highway noise as I was in the rear of the park. Sites are fairly spread out and not close to the neighbors. I would stay here again. We camped at Square Dance Center and Campground in a Fifth Wheel. The park is in mature fir trees and is attractive and peaceful. Utilities are dated (no switch/breaker on electrical box) but worked fine. Bath/showers are clean but simple. Nice people. We camped at Square Dance Center and Campground in a Travel Trailer. A few miles south of Missoula which has everything including traffic. Lolo has fuel and restaurants. Hwy 12 west is a long frive of mountains and whitewater river, national forest. 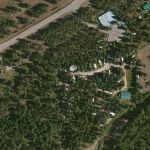 Beautiful campground with large pines, good space between sites and the nicest owners you'll meet anywhere in the country. We moved sites when one by the creek opened up and because of it being early season we were by ourselves. We had a campfire and enjoyed the sounds of the creek. Beautiful facility with good wifi and very clean restrooms. Owners keep the grounds immaculate and we will highly recommend this campground to friends and family. We camped at Square Dance Center and Campground in a Travel Trailer. Drive to Missoula for Biga Pizza! Best pizza we've had. Visit Blue Mountain Recreation Area for a fun day of hiking and beautiful scenery. Very nice shady park that felt more like a Nat'l Forest Service park except that it had hookups. Sites were worked in around existing trees rather than all in a row. Could have easily stayed here longer, except that we needed to move on and they closed in a few days (end Sept) for the season. As others wrote, very quiet and along Lolo Creek, about 2 miles beyond the Travelers Rest State Park. Very friendly management that drove you to your site. Most are back in, but we had a nice pull thru. Only real negative, would be more gravel at site so that it wouldn't either be too dusty OR too muddy. We camped at Square Dance Center and Campground in a Motorhome. Travelers Rest State Park about the documented campground of Lewis and Clark's Corps of Discovery in 1805 and 1806 was excellent. As others have said it's a nice campground. Quiet sites well spaced. EXCEPT for the dust! When the wind blows the dust flows. When some drives through the dust flows. If you like to clean dust off everything this is the place. Forget about satellite, and AT&T service is almost nonexistent. We camped at Square Dance Center and Campground in a Motorhome. Drive up Hwy 12 is beautiful! Drive to Darby Montana is Beautiful too! We had a lot to do and see in this area. We like it very much! Many things to do in Missoula and Lolo. Only nine miles from Missoula and great dining - visit on Wednesday for the "out to lunch" festival along the river. Traveler's Rest, the only verified Lewis and Clark camping location, is just down the road. Lots of stuff to do in Lolo/Missoula. Missoula Osprey baseball is good. Are you affiliated with Square Dance Center and Campground ?